The 2011 version of Tyler Tettleton came a year too early: A calm and collected first-year starter who gained most of his charisma by out-darting opponents on the turf as the MAC’s 14th leading rusher. The 658 yards on 166 attempts was only a mere half of what Northern Illinois field general Chandler Harnish racked up, but the Oklahoma gunslinger’s stats in Ohio’s 10-4 campaign would have ranked him as the second-best rushing quarterback in 2012. He played in two less games in 2012 and rushed 46 fewer times, all while only compiling just over a third of the yards he accumulated as a redshirt sophomore the year before. The Bobcats’ season came apart at the hinges last year about the same time Tettleton could no longer deliver balanced games, even when the game plan called for double-digit carries. You can credit last season’s second-half struggle to an ailing offensive line and Tettleton’s rib and shoulder injuries, but any Green and White fan who hung with the team during the three-game losing streak that concluded the season would tell you that Ohio’s dual-threat quarterback was hesitant to run as the season went on. Given an offseason to recover going into the final season of his legendary Bobcat career, Tettleton is confident that his health will not limit him from making plays on the ground. He just has to be given a chance. It’s not that the Ohio coaches don’t have trust in Tettleton’s legs. The staff believes that the depth at running back (which includes a balanced trio of speed, strength and everything in between) will be able to carry the offense farther with Tettleton focused on dropping back to pass. Beau Blankenship, who was the conference’s second highest rusher in 2012 behind NIU quarterback Jordan Lynch, now has help in Ryan Boykin and Daz’mond Patterson that are up to speed with the offensive system. Without having those three backs in Ohio’s offensive rotation in 2011, Tettleton primarily only split carrying duties with star back Donte Harden. Relying on one play-making halfback and LaVon Brazill and Riley Dunlop as a deep threats, the playing field was open for Tettleton to run a lucid offense. Despite the same man being under center, the difference in depth charts from 2011 to 2013 call for a change in scheme. “Obviously if I have the chance to run, then I’ll try and make plays, but I would rather give the ball to our playmakers,” Tettleton confessed. He was given that chance to vary his offensive game and be a playmaker at the start of last season against Penn State, as he threw for 324 yards and two touchdowns and rushed nine times for 47 yards and an additional score. That’s the Tyler Tettleton that helped lead the ‘Cats to their biggest win in program history against a Big Ten power on the road. That Tettleton also appeared in another one of 2012’s most gut-wrenching battles: a week three victory in Huntington against the Marshall Thundering Herd. 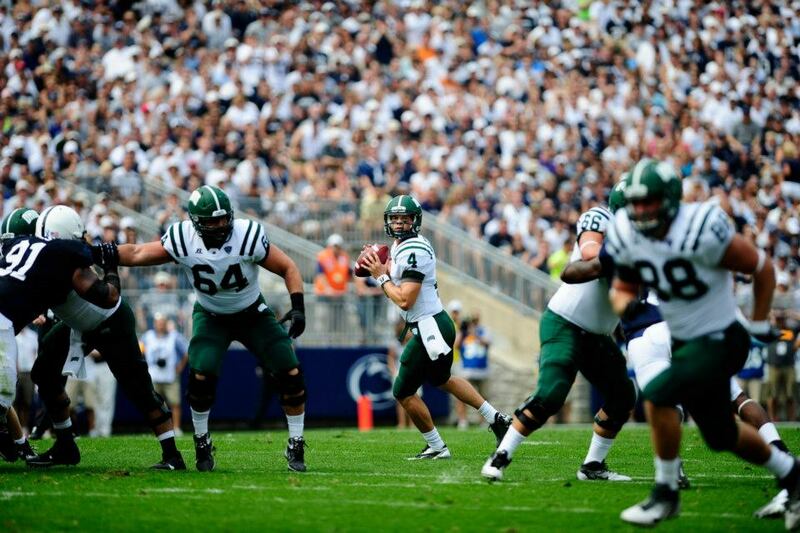 Facing a third-and-ten at their own 20-yard line and down by a touchdown to start the fourth quarter, Tettleton took command and scrambled after blocking broke down. He picked up 12 yards, and the rocking and deafening screams from Marshall fans were silenced for one of the few times that night. The eventual outcome of the drive was a fourth-and-5, 27-yard touchdown pass to Ryan Clark that knotted the game at 24 and put the ‘Cats in position to claim the victory. That drive kept alive the dream of an undefeated season for Ohio, a dream that would end in week eight. Neither of those plays seems like of much importance in context right now, but seeing confidence protrude from Tettleton in two extremely dynamic games whenever he took to the ground has me convinced that the same chemistry he created with the offense when he got his start can be recreated if his legs are utilized. For now, the offense will move forward with Tettleton being the catalyst of the team, working hand-in-hand with the team’s play makers. Wide receiver Donte Foster, who also hails from Oklahoma and lives with Tettleton, praised his quarterback’s leadership ability: To motivate teammates without being too harsh of a critic. His offense wants to make blocks and catches for him out of respect, and that’s why his fingerprints are all over Bobcat record books. The current holder of seven career records has a certain characteristic to thank for his amazing feats. “I feel like he keeps his poise at great times,” Foster said. That poise slowly started to fade as the 2012 campaign came to a close. After starting the season running to pick up positive yardage, Tettleton found himself scrambling around the field in an attempt to avoid ferocious defenders. When his offensive focus became more conservative, deficits became larger. The three-game skid that concluded the 2012 regular season contained no trace of poise from Tettleton, mainly because he was never in a situation to display that talent down the stretch. Through two games, Ohio has already brushed a blowout loss and hard-fought win under the carpet to retain focus. The Bobcats have seen both many times throughout the past three seasons, but the hard-fought wins usually come when Tettleton takes to his feet. The decision to take Tettleton out of the pocket rests solely in the hands of the coaching staff and play callers. Seeing No. 4 loop around the right side of the offensive line a few times doesn’t guarantee success this season, but it would definitely open up the playbook more. The determining factor in labeling this season as a success or failure at the end of November rests in Tettleton’s faith in the institution, and that’s as strong as it has ever been.